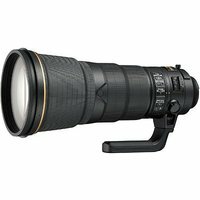 The Nikon 400mm f2.8 AF-S E FL ED VR Lens is a professional FX-format super-telephoto prime lens ideal for sports and news photographers who demand top performance. The lens boasts a professional-grade dust and moisture construction, a bright f/2.8 maximum aperture, a fast auto-focus system (AF-S) and Nikon's new Sport Vibration Reduction (VR) mode to deliver exceptional image quality, speed and accuracy. The newly designed optical construction incorporates 16 elements in 12 groups, including two fluorite and two ED elements. Using fluorite for the front two elements reduces the weight (820g lighter than its predecessor) in the front part of the lens and shifts its centre of gravity to the rear, ensuring comfortable handling and stable operation. Additional features include a professional-grade dust and moisture resistant construction, bearings in the tripod collar ring, a one-piece reversible lens hood and an integrated tripod foot that now faces the front of the lens.